Wonder how to get Coin Emperor Kench? The skin is in the Legacy vault, which means it is not available in the store. However, you can obtain it in 3 ways: as Loot from Hextech and Mastery Chests, as Random content from rerolling cosmetic content, as Mystery content from Mystery Gifts! 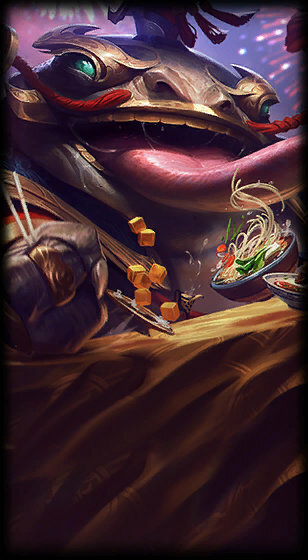 Craving the smell of coins over all earthly delights, Tahm Kench rises from his kingdom beneath the river every Lunar Revel, seeking bargains with mortals. Though his targets are inevitably left destitute, it is thought that with the proper reverence and careful wording, one can escape his bargains unimaginably wealthy. This skin is a part of the Lunar Revel skin line. They always feature amazing updated graphics and animations that make battles ingame absolutely stunning! If you want to check out the new patch, Lolskinshop can help you, we are selling PBE accounts. Note Lolskinshop.com does not sell this skin, never have, and most likely never will! This page is an information page. We have collected all the different parts needed to create one good page that highlights every part of this specific league of legends skin. We would also like to point out that the only way to ever getting this skin is through Loot from Hextech, Mastery Chests, and Mystery Gifts. There is no point looking for it on Ebay or other third party sites, it simply does not exist! Coin Emperor Kench skin review and information.